The brief? 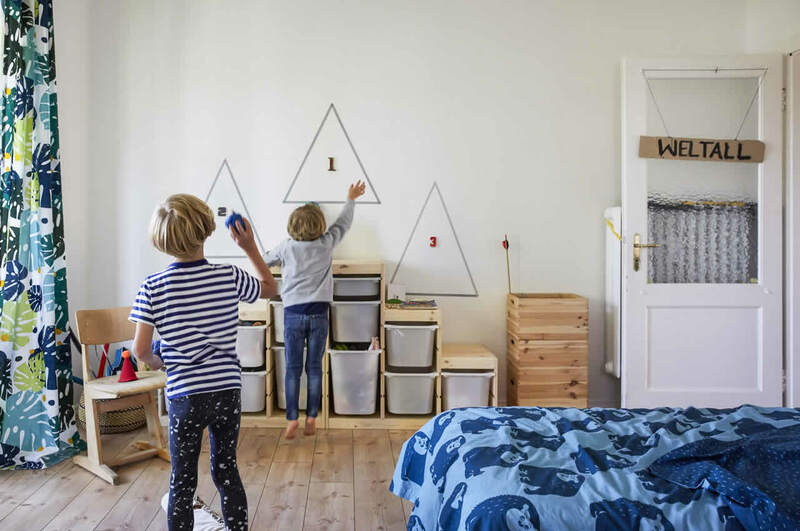 Update a shared kids’ bedroom by adding smart and affordable storage solutions and imaginative ways to play. The result? Two very excited children! For brothers Henri (7) and Toni (5), their bedroom is also their playroom – a space to play freely and let their imaginations run wild. 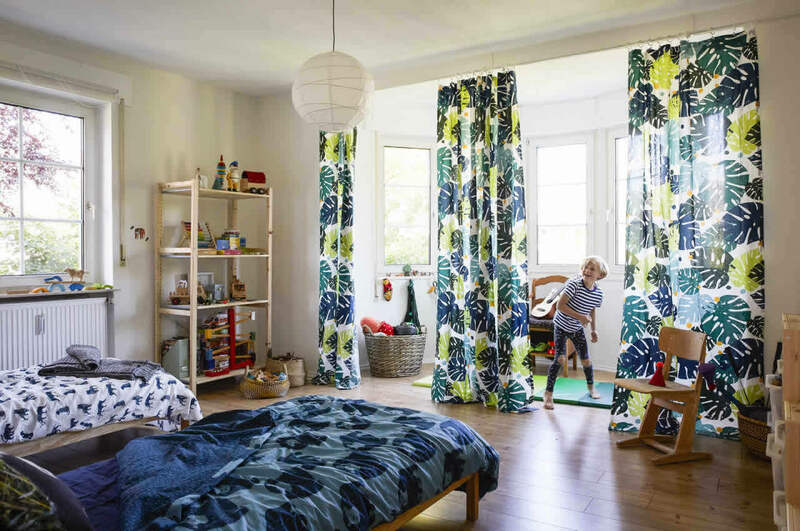 Right now, they love everything jungle, so adding botanical and animal print textiles was the easiest and most cost effective way of adding character to their all-white room. Stylist Ashlyn Gibson hung curtains in front of the curved bay window to transform an unused space into a theatrical stage (complete with gym mat for more acrobatic performances). She also added a rail of hooks under the windowsill – an easy-to-reach height that’s the perfect place to store costumes for a quick outfit change ‘backstage’. "The boys often build up whole worlds that start from their bedroom and run through the rest of our home, storage boxes let them carry toys from room to room," says Nina. Stylist Ashlyn Gibson thought the TROFAST boxes looked a lot like a winner’s podium, so she used roll of tape and wooden numbers to bring it to life – creating another game in the process! Remember to use the fixings provided to secure furniture to the wall. 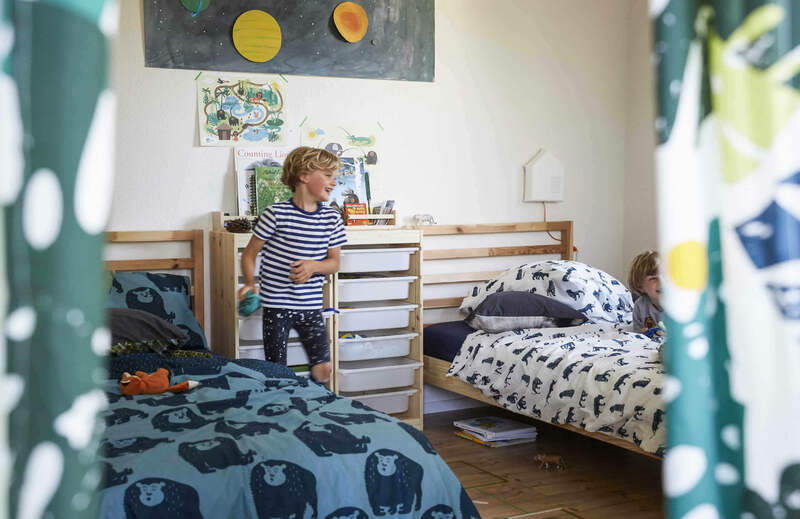 If siblings are lucky enough to share a big room, experiment with a layout that encourages both togetherness and private time. Being close in age, the boys’ bedtime routines happen at a similar time so it works having their beds side by side. "Their personalities do sometimes clash, but I think you learn a lot from sharing a room. When they need time apart, Henri has started gathering pillows and making his own reading den behind the curtains," says mum Nina. As much as we embrace technology playing a part in our children’s lives, sometimes you can’t beat an old-school game. Hopscotch is active, easy to play and even easier to set up indoors. You don’t need a whole playground, just a few paces of free floor space, a roll of colourful washi tape and something to use as a marker, like a bean bag or a soft toy. Hop to it!